Supply of perforated metal panel work on wall including the necessary acoustical insulation, furring channels and all related fasteners, trims and flashing as per HESCO standard details and shop drawings. Variquiet, field Assembled Acoustical Wall Panel System having a perforated metal liner and acoustical insulation fixed on hat shape furring channels. Perforated steel panels, 305 mm wide, formed from galvanized steel sheets gage 0.60 mm to 0.75 mm and conforming to ASTM A446 structural quality with hot dipped commercial quality galvanization designation G-90. Perforation shall be in diameter 3mm and spaced 10mm staggered to achieve noise reduction coefficient (NRC) of 0.95 or better. Side joint shall be in male/female interlocking type formed from solid material. Side joints shall be formed as per HESCO standard details and shall be sealed using a special EPDM neoprene gasket. Fiberglass blanket insulation, approximately 38 - 50 mm thick and have special properties to achieve NRC value of 0.95 or better and shall be foil faced or vinyl backed at one side. Wire mesh spacer made of galvanized steel mesh approximately 25 x 25 mm shall be used between perforated sheets and acoustical insulation. Hat shape galvanized steel conforming to ASTM A446 designation G-90 having a gage of approximately 0.7 mm or as recommended by HESCO. depth, girth and spacing of furring channels shall be as per HESCO standard details and recommendation. Securely fasten hat-shaped furring channel to walls using special concrete fasteners as per HESCO standard and recommendation. 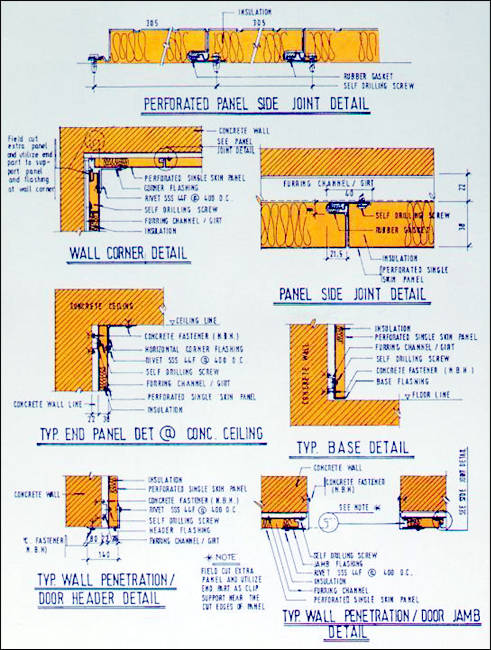 Install perforated metal panels plumb in proper alignment level to within a ratio of 1 to 500 and in strictly accordance with HESCO shop drawings and instructions. Arrange panels symmetrically on each surface, unless otherwise indicated lay wire mesh spacer in perforated panels before placing acoustical insulation to keep insulation slightly back from perforated face. Acoustical insulation shall be a snug fit in perforated panels. Cut metal panels shall be at least 50 percent of unit width. Scribe panels to fit adjacent work. Apply trim and fastenings as per HESCO standard details and recommendation. Concealed fastening system using stainless steel fasteners to fix panels to furring channels and stainless steel pop rivets for fix the necessary flashing shall be provided by HESCO as per HESCO engineering details and standard practice. using solid material having the same gage, finish and matching colour as that of the perforated panels. flashing location, girth and fixing details shall be in accordance with HESCO standard engineering details.